“The Creator Effect” embraces the concept that we can create anything we desire through our intention. This concept has origination in the Quantum principle of “The Observer Effect”. This experimentally proved theory states that we affect an outcome just by observing an event, it encapsulates the power of intention and confirms we are the masters of our own destiny. “Intanglement” embraces the concept of oneness, that we are all part of the energy of the universe and that some particles are more entangled than others. When we turn the Quantum principle of “Entanglement” internally into our own personal universe, we can seek and find our other selves. We who live in a timeless space of all ages, all alternate realities, parallel lives and our pure soul state. All are held within our personal universe. “Everywhereness” works on the Quantum principle of “Non locality”, that electrons can be in more than one place at one time, in fact they are everywhere at once in their awareness that they exist as probabilities until observed. We exist in all dimensions at the same time, beyond though including all linear time zones. We can visit these places to find the healing and wisdom that serves the greater being that we are. 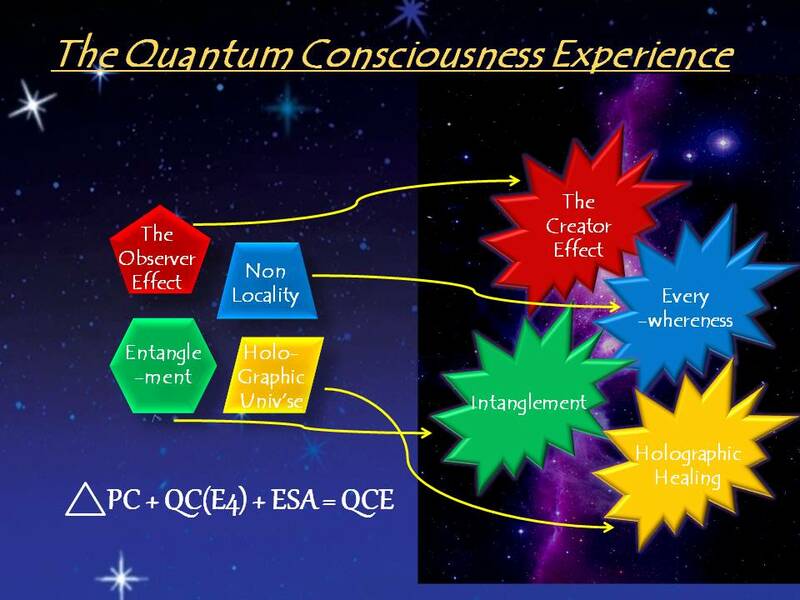 “Holographic Healing” works on the Quantum principle that we live in a “holographic universe”. A universe in which the large and the small are the same and that the smallest piece contains all. This simply means that any wisdom we uncover from our other selves, any healing we undertake can then send an evolving wave of higher consciousness rippling out into the fabric of the cosmos to serve the universe itself. Our personal universe is simply a holographic subset of all there is.